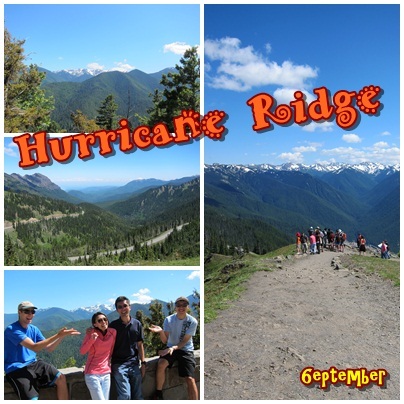 Our friends and us made a day trip to Sequim,WA and Port Angeles (nah.. Forks was just too far) It was a tiring trip! We started at 6.45am and only reached home at 1.20am, the next day! Glad we went ahead with the plan as it was very enjoyable! 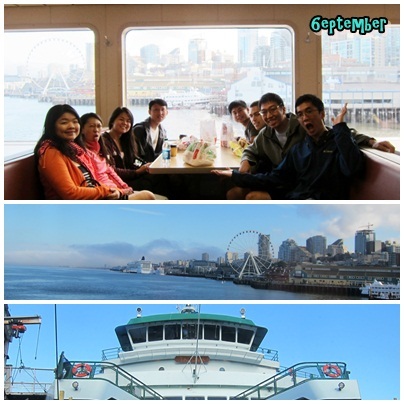 We got on the ferry – Seattle > Bainbridge Island. View on ferry was very pretty! A nice day! See the new addition to Seattle skyline? The ferries wheel! 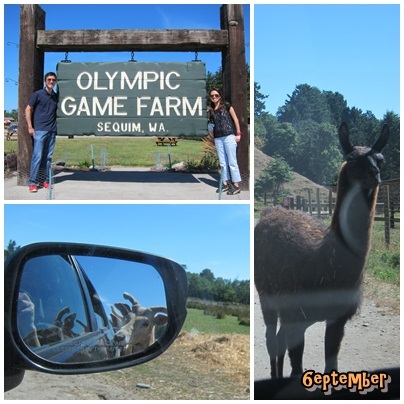 First destination was Olympic Game farm – This farm allows cars to drive through . However, you are allowed to feed some of the animals with wheat bread. To me, it was super interesting! I have never been to a game farm before! 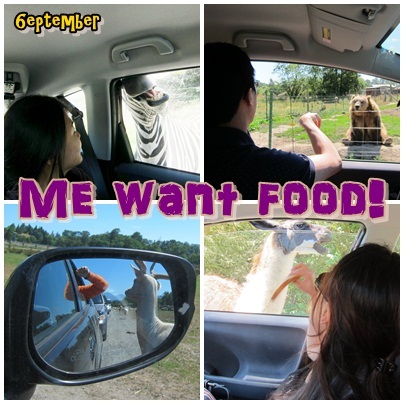 Feeding the animals enable me to see them super up-close! The llama are the most aggressive! They actually chase after the car for food! haha.. we were screaming! so funny! We only saw 1 zebra, which was quite greedy!! See… it’s biting the car window!!! shiver~~ Fear not!!! Most of these animals are trained! The cutest animals are the bears!! they are super friendly! When they saw our car approaching the enclosure, they came right to the front and just sat there. It was as though waiting for us to take its picture! I mean I didn’t even know that the animals were trained to interact with humans until I read the website/facebook page closely. You know what?! the bears actually waved to us too!! Like really waved!!! gosh! I was thrilled – didn’t manage to catch it on my camera but you can see lots on youtube!!!! 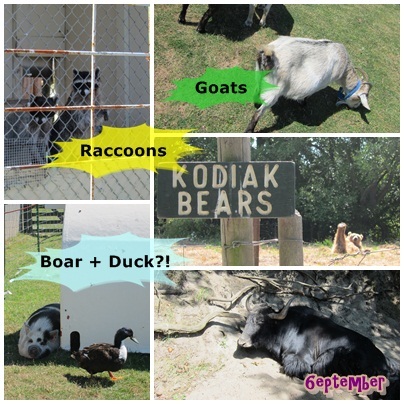 Feeding the bears with bread is like playing an arcade game – haha.. they open their mouths and u got to aim it right! We had alot of fun doing that! 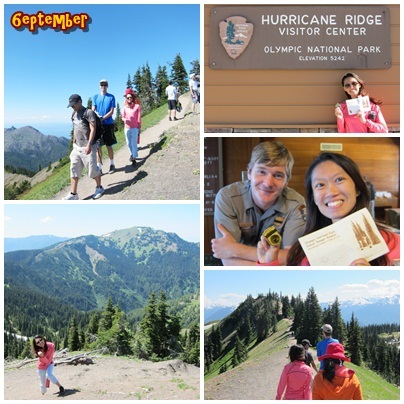 We took a very short and easy trail ( not sure what’s the name) but the view was spectacular! 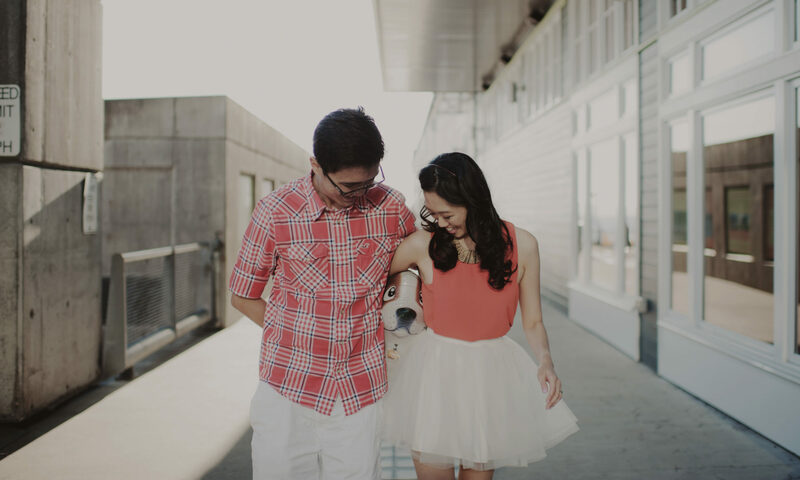 Somehow, time seems to pass really fast. Maybe we just spend alot of time driving. Thank you to BH and Justin for doing the driving! Dinner was at Port Angeles(PA)! 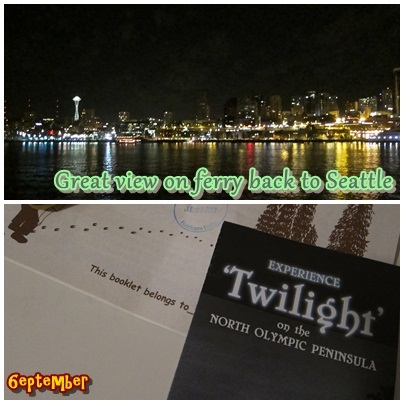 PA was mentioned several times in Twilight! 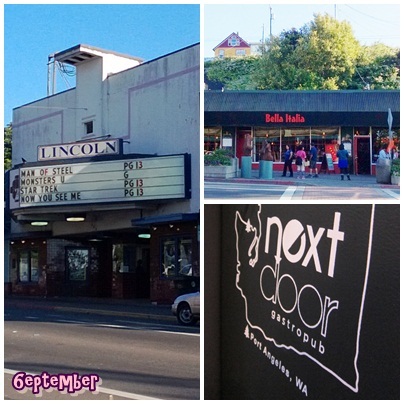 Below shows the movie theater ‘Lincoln’ which Bella and friends watched movie. ‘Bella Italia’ is the restaurant which Bella and Edward had their first date ( Edward didn’t eat) I am a ‘medium’ Twilight fan, so to me it’s a “wah!!! I’m actually here!” feeling! hehehe.. we wanted to dine at ‘Bella Italia’ but it was just packed! In the end, we ate “Next Door” literally! !